Click here to download a PDF of the polling memo from Greenberg Quinlan Rosner Research. Click here to download a PDF of the complete poll results. 2016 was a turning point for internet and tech companies. The presidential election called attention not just to the proliferation of propaganda or “fake news,” but also to the extent that these companies harvest and profit from people’s personal information. Data breaches have not been uncommon, but this election highlighted the dangers of stolen data. Unsurprisingly, there is considerable support for increased regulation of monopolies (67 percent support) and of internet and technology companies (43 percent of people want more regulation). 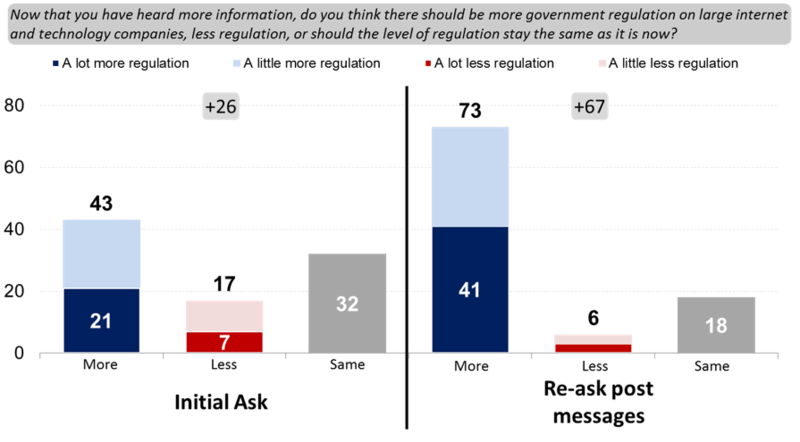 Support for regulation is higher among Democrats (56 percent want more regulation) than independents (40 percent want more regulation) and Republicans (31 percent want more regulation). Testing messages about the need for regulation produces a seismic shift in attitudes (41 point net shift towards support of regulation). Ultimately, 66 percent of independents and 67 percent of Republicans support more regulation. Few people believe that they control the information collected about them online (59 percent little or no control) and majorities say internet and technology companies have a negative effect on personal safety (50 percent negative, 25 percent positive) and privacy (77 percent negative, 14 percent negative). Indeed, a plurality thinks the impact of internet and technology companies on society is negative (46 percent negative, 37 percent positive). The main benefit of the rise of internet companies has been economic (58 percent positive, 26 percent negative) and on the prices people pay (54 percent positive, 25 percent negative). The most prominent internet companies – Facebook, Google and Amazon – have distinct profiles. 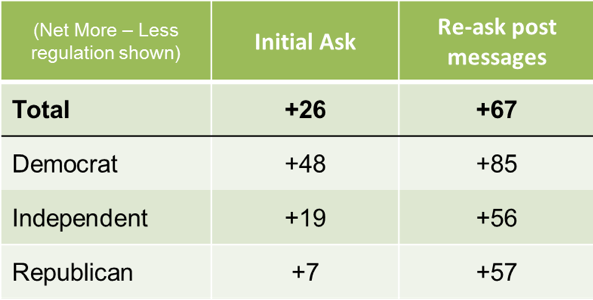 Voters have mixed views about Facebook (33 percent favorable, 39 percent unfavorable), but fully two thirds (63 percent) do not trust Facebook to obey the law when it comes to their personal information. Negative views about Facebook are dominated by both privacy and political concerns. While most think the best thing about Facebook is its role in connecting people to friends and family (69 percent), huge numbers say that Facebook makes it too easy to spread misinformation and fake news (29 percent) and allows hate groups to spread content (27 percent). Many also cite data collection on individuals (19 percent) and using personal information to target advertising (19 percent). In an open ended context, a significant number (23 percent) also talk about Facebook as time consuming, addictive and having too much drama/gossip. Voters are much more favorable towards Amazon (65 percent favorable, 14 percent unfavorable) and Google (63 percent favorable, 17 percent unfavorable), and are much more likely to trust these companies to follow the law. Voters love the convenience and prices afforded by Amazon and the free products offered by Google. But Google has its own vulnerability around data privacy – 26 percent cite Google Home listening to users, 24 percent cite personal data collection and 20 percent cite using personal information to target advertising as the “worst” things about Google. Privacy concerns are muted with Amazon. Instead people worry that the company is too big, shutting down local mom and pop stores (33 percent) and paying low wages to warehouse workers (30 percent). Click here to see the complete poll results. People understand instinctively that something needs to be done. Fifty eight percent of voters say the argument that advertising online should be regulated in the same way as other political advertising (e.g., disclosure) is a very convincing reason to regulate internet companies. People overwhelming agree with arguments calling for more regulations to protect privacy and safety and end special treatment for internet and technology companies. And, as noted above, after hearing these arguments, voters move dramatically to a place of more support for regulation (43 to 73 percent). On behalf of Campaign for Accountability, GQR conducted a national live interview phone poll of 1,001 registered voters. Fifty percent of interviews were conducted via cell phone. The sample carries a margin of error of +/- 3.1 percentage points at the 95 percent confidence interval. Margin of error is higher among subgroups.